Los Angeles, California–On July 24th, Terror Films released its first horror film, The Chosen in a co-distribution partnership with Supergravity Pictures. The film was released on various platforms, including iTunes where it has remained in the top 100 of all horror films for over 8 weeks. As of December 1st, the film is now available through an exclusive SVod deal on Netflix and will be available at Redbox starting December 15th. The film centers around Cameron (Kian Lawley), a directionless 19 year-old destined to never leave his hometown. He is thrust into the role of hero when his 10 year-old niece, Angie (Mykayla Sohn), becomes possessed by the mythical demon Lilith. With only six days to break the demon's grip on the child, Cameron, with the help of his sister (Angelica Chitwood), must perform the unthinkable task of systematically killing his family members. He must do this in order to rid his niece of the demon and bring peace to his fractured household. 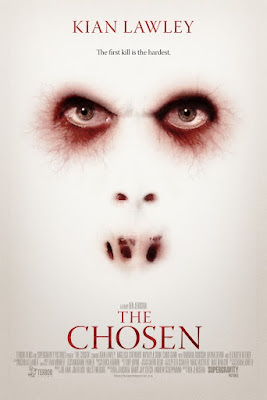 Terror Films’ Joe Dain, Miles Fineburg and Jim Klock produced the film and The Chosen stars Kian Lawley, Elizabeth Keener, Angelica Chitwood, Mykayla Sohn, Barbara Goodson, Chris Gann, Casey James Knight, Emily Killian, Dayna Devon, Harv Popick and Penelope Richards.